In a Lane at Kenilworth, Warwickshire. An antique etching by B.T. Pouncy after T. Hearne. Published June 2nd, 1798 with later hand colouring. Strengthened in top left corner by old paper on verso. Kenilworth Castle in Warwickshire. Plate 1. An antique line engraving by Richardson which was published by Alexander Hogg in "The Antiquities of England and Wales Displayed in 1795. Kenilworth Castle in Warwickshire. Plate 2. Three Prospects of Kenilworth Castle. More Info An antique print depicting the prospects of Kenilworth Castle from 1. The old park on the South side. 2. From the road from Coventre to Warwick. 3. From Bull Hill near the road from Colshill towards Warwick. 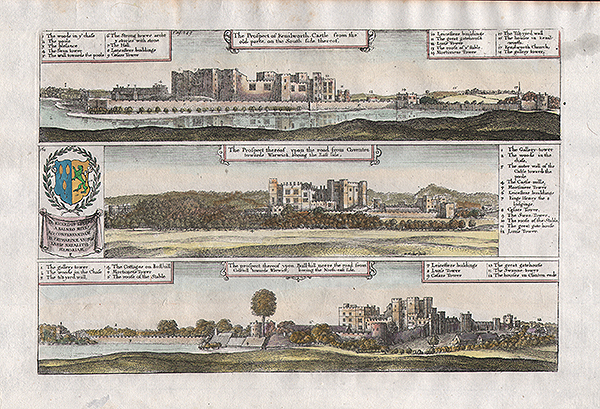 A key identifies various locations in each prospect which were drawn by Wenceslaus Hollar and published in Sir William Dugdale's 'Antiquities of Warwickshire' in 1730 with later hand colouring. An antique print depicting the prospects of Kenilworth Castle from 1. The old park on the South side. 2. From the road from Coventre to Warwick. 3. From Bull Hill near the road from Colshill towards Warwick. A key identifies various locations in each prospect which were drawn by Wenceslaus Hollar and published in Sir William Dugdale's 'Antiquities of Warwickshire' in 1730 with later hand colouring. The Ground Plot of Kenilworth Castle. 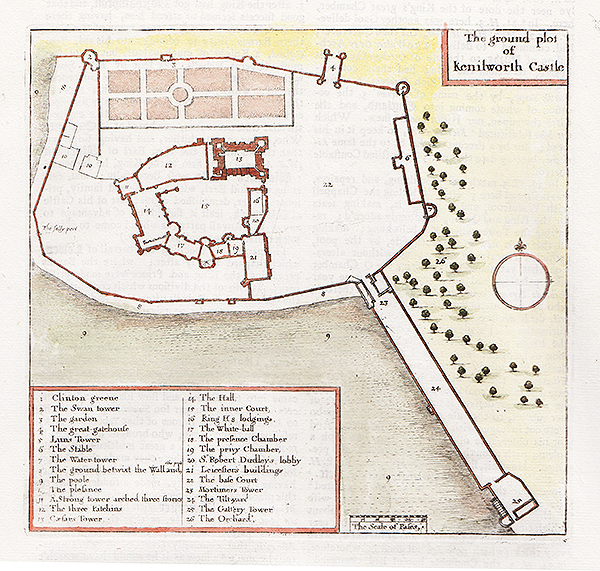 An antique plan of Kenilworth Castle published in Sir William Dugdale's 'Antiquities of Warwickshire' in 1730 with later hand colouring. Twenty six locations in the castle are indicated in the 'Key; in the botomleft corner. Text on verso. The East View of Kenelworth Castle in the County of Warwick. An antique sepia aquatint after Samuel Ireland. Published in 1795. An antique line engraving by Rock & Co. London. Circa 1860 with later hand colouring. An antique line engraving by Rock & Co, London. Published on October 10th, 1850 with later hand colouring. Shows Lunn'sTower and the Gate House. An antique line engraving by T. Radclyffe after J. W. Published by W. Emans, Sept. 19th, 1829. Later coloured by hand. An antique line engraving by J.Brandard. Published by C. Elston. Circa 1860. Later coloured by hand. An antique line engraving by John Roffe after Jeayes. Published in 1814. An antique line engraving by Mathews after C.V. Fielding. Published in 1814. An antique line engraving by W. Byrne after T. Hearne. F.S.A. Published in 1800. Kenilworth Castle West - The Strong Square tower and Great Hall. An antique line engraving by J. Brandard after P. Cormouls. Published in 1831. East view of Kenelworth Castle. Kenilworth Castle - View of part of the Hall. An antique line engraving by Joseph Skelton after Charles Wild for the Architectural Antiquities of Great Britain. Published in 1813. An antique line engraving by W. Radclyffe after J.V. Barber showing the view from a tower at the South end of the Great Hall. Published in 1829. The colouring is later. An antique sepia aquatint after Samuel Ireland. Published in1795. An antique line engraving published by J. & F. Harwood in 1841. The colouring is later.